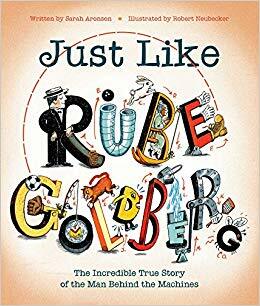 In this charming picture book biography, Aronson celebrates the creative genius of Rube Goldberg (1883-1970). An American cartoonist, Rube was best known for his cartoons that depicted complicated gadgets that performed simple tasks under the pen name of Professor Lucifer Gorgonzola Butts. Things like: How Do You Put Holes in Doughnuts?” or “How Do You Cut Your Own Hair?” By his death at age eighty-seven in 1970, Rube had created more than 50,000 cartoons. Neubecker’s full-page illustrations, rendered in number-two pencil and ink and then on a Macintosh computer add much energy to the narrative. He really did capture Goldberg’s style, especially when drawing his inventions. The end papers have reproductions from some of Rube’s cartoons. My favorite is: The Only Sanitary Way to Lick a Postage Stamp. 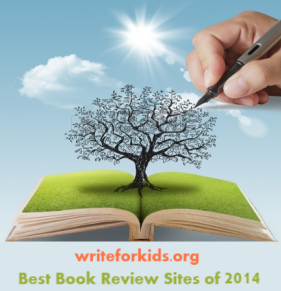 The book does include an author’s note and source materials.